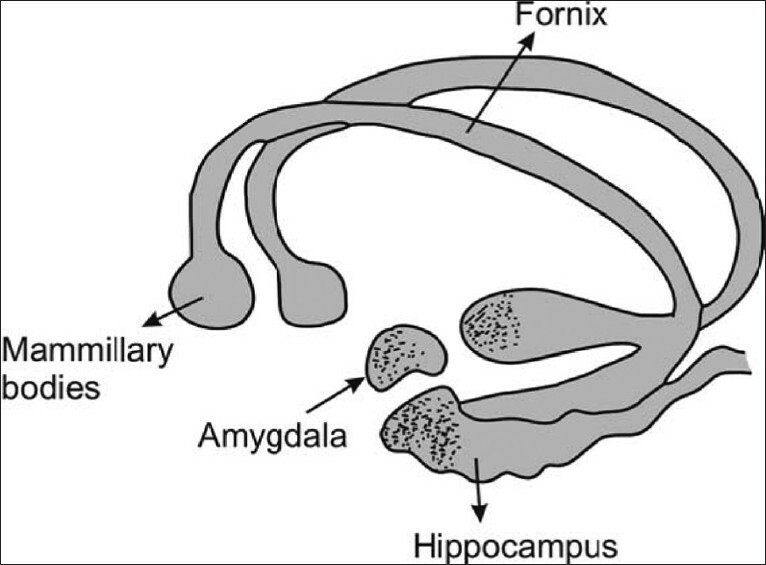 Hippocampus is a complex brain structure embedded deep into temporal lobe. It has a major role in learning and memory. It is a plastic and vulnerable structure that gets damaged by a variety of stimuli. Studies have shown that it also gets affected in a variety of neurological and psychiatric disorders. In last decade or so, lot has been learnt about conditions that affect hippocampus and produce changes ranging from molecules to morphology. Progresses in radiological delineation, electrophysiology, and histochemical characterization have made it possible to study this archicerebral structure in greater detail. Present paper attempts to give an overview of hippocampus, both in health and diseases. Background: The ancient mind and body healing methods of yoga recently sparked fervor in the scientific community as an alternative and complementary means of therapy. Since the World Health Organization officially began promoting yoga in developing countries in 1978, yoga has been cited for its therapeutic potential and has been widely recognized in Western culture. However, as an increasing number of people practice yoga for remedial purposes, researchers raise two important questions: 1) Is yoga a valid complementary management and rehabilitation treatment modality? 2) What conditions show promise of treatment with this intervention?. Objective: This review article uses comprehensive scientific, evidence-based studies to analyze the efficacy of various basic and applied aspects of yoga in disease prevention and health promotion. It specifically intends to expose the effects of yoga in neurological disorders, particularly epilepsy, stroke, multiple sclerosis, Alzheimer's disease, peripheral nervous system disease, and fibromyalgia. Materials and Methods: Information was gathered from various resources including PubMed, Ovid, MD-Consult, USC, and U.C.L.A. libraries. Studies were selected and reviewed on the basis of sample size, control, randomization, double-blinding, and statistical analysis of results. Results: The pratice of yoga and meditation demonstrates statistically encouraging physiological and psychological improvements in the aforementioned neurological disorders. However, there were certain flaws and inadequacies in the study designs employed to evaluate the same. A critical analysis of these studies is presented. Conclusions: With the aim to focus attention on this widespread yet largely unexamined treatment modality, this paper seeks to provide direction and support for further research necessary to validate yoga as an integrative, alternative, and complementary therapy. Patients with restless leg syndrome present with sensory symptoms similar to peripheral neuropathy. While there is evidence of abnormalities of dopaminergic pathways, the peripheral nervous system has been studied infrequently. We studied conventional nerve conduction studies, quantitative thermal sensory testing and sympathetic skin response in 57 patients with primary restless leg syndrome. Almost two third patients demonstrated abnormalities in the detailed testing of the peripheral nervous system. Sbtle abnormalities of the peripheral nervous system may be more common than previously believed. Background: There is paucity of methodologically sound published studies on intracerebral hemorrhage (ICH) from India, on pub med/embase search. Aims: To explore etiology of ICH and correlate the causes, location, and size of hemorrhage to clinical outcome. 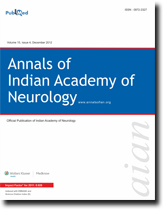 Materials and Methods: A hospital-based descriptive study from South Indian eastern coastal town of Puducherry; 60 consecutive subjects aged > 12 years, predominantly of inbred Tamil population, with head CT evidence of intracerebral hemorrhage not associated with trauma and brain tumors, were recruited. Outcome at three months was measured using Glasgow Outcome scale, NIHSS and mortality. SPSS v 19 was used for statistical analysis. Results: Commonest etiological factor was hypertension, followed by bleeding diathesis, thrombolysis for myocardial infarction, and cortical vein thrombosis. Most frequent locations of hematoma were basal ganglia, thalamus, internal capsule, and cerebral and cerebellar parenchyma. Hematoma volume correlated significantly with systolic and mean arterial pressure but not with diastolic blood pressure. Poor outcome was correlated to size (P < 0.05) and intraventricular extension of hematoma (P < 0.05), and to systolic, diastolic and mean arterial pressure, but not to age, gender, smoking, alcoholism, ischemic heart disease, and blood sugar level. Among diabetic patients with ICH, the size of hematoma (P = 0.04) and severity of coma (P = 0.01) at admission were significantly worse compared to the non-diabetic, but not the outcome at three months [Glasgow outcome scale or mortality (P = 0.94 and 0.14)]. Conclusions: The location of hemorrhage and correlation with outcome agreed with the patterns described for the non-white races in prior reports. Independence of outcome to diabetic status despite a more severe initial presentation may indicate importance of good care, even in high risk groups. Context : Impairment of initiating sequential movements and processing of proprioception contribute to characteristic Parkinson's disease (PD) gait abnormalities. Many studies have used a single external cue or 2 different cues to correct PD gait. Aim: An aim of this study was to determine the influence of paired proprioceptive cues on gait parameters of individuals with PD. Setting and Design: Double-blind randomized controlled trial. Materials and Methods: Subjects were 30 PD patients who had mild to moderate impairment according to the United Parkinson's Disease Rating Scale (UPDRS). They were randomly assigned to either a routine physiotherapy program or treadmill training with vibratory stimuli applied to the feet plantar surfaces and proprioceptive neuromuscular facilitation (PNF) as well as the same physiotherapy program. All Participants received a 45-minutes session of low intensity physiotherapy program, 3 times a week, for 8 weeks. The duration of treadmill training was 5 minutes at baseline and 25 minutes at the end of treatment. Walking speed and distance were recorded from the treadmill control panel for both groups before and immediately after the end of treatment. The Qualysis ProReflex motion analysis system was used to measure cadence, stride length, hip, knee, and ankle joints' angular excursion. Results: The cadence, stride length, and lower limb joints' angular excursion showed a significant improvement in both groups (P ≤ 0.05). These improvements in spatio-temporal parameters and angular excursion were higher in the study group than in the control group (P ≤ 0.05). Conclusion: Potentiated proprioceptive feedback improves parkinsonian gait kinematics, the hip, knee, and ankle joints' angular excursion. Background: The occurrence of epilepsy is higher among elderly patients. The clinical manifestations of seizures, causes of epilepsy, and choice of anti-epileptic drugs (AEDs) are different in elderly people with epilepsy compared to the young. Aim: To evaluate the imaging (CT/MRI) observations in elderly patients manifesting with new-onset seizures. Materials and Methods: Two hundred and one elderly patients with new onset seizures, >60 years (age: 68.0 ± 7.5 years; M:F = 1.8:1) from Jan' 07 to Jan' 09, were prospectively recruited. Observations of cranial CT scan (n = 201) and MR imaging (n = 43) were analyzed. Results: The type of seizures included: Simple partial (42%), generalized tonic-clonic (30.3%), and complex partial (27.4%). The pattern of epilepsy syndromes were acute symptomatic (42.3%), remote symptomatic (18.4%), cryptogenic (37.8%), and idiopathic (1.5%). Seizures were controlled with monotherapy in 85%. 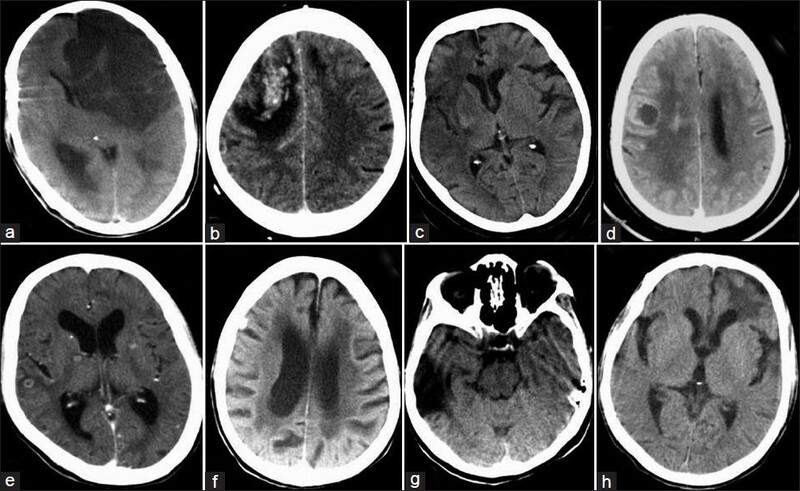 The CT scan (n = 201) revealed cerebral atrophy (139), mild (79), moderate (43), and severe (18); focal lesions (98), infarcts (45), hemorrhages (18), granuloma (16), tumor (15) and gliosis (4), and hemispheric atrophy (1), white matter changes (75) and diffuse edema (21). 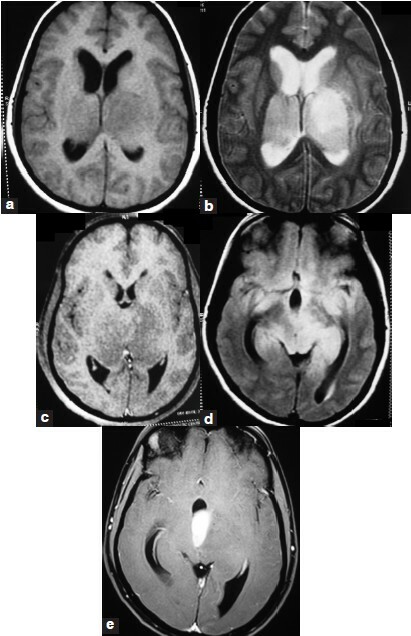 An MRI (n = 43) showed variable degree of cerebral atrophy (31); white matter changes (20); focal cerebral lesions (24); - infarct (7); intracranial hemorrhage (6); granuloma (5); tumor (6); gliosis (1); hemispheric atrophy (1); and prominent Virchow-Robin spaces (7); and UBOs (12). Patients with focal lesions in neuroimaging more often had partial seizures, symptomatic epilepsy, past stroke, focal deficit, absence of diffuse atrophy, focal EEG slowing, abnormal CSF, seizure recurrence at follow-up (P < 0.05). Conclusions: Brain imaging observations in elderly patients with new-onset seizures revealed underlying symptomatic nature, hence the etiology and thereby assisted in deciding the specific therapy. Context: Oxidative stress can be a final common pathway for AED-induced teratogenesis. Aims: To compare the oxidative stress of women with epilepsy (WWE) and unfavorable pregnancy outcome (fetal malformation or spontaneous abortion - group EM) with that of WWE with normal pregnancy outcome (group ENM) and healthy women with normal pregnancy outcome (group C). Materials and Methods: We identified WWE under group EM (n = 43) and group ENM (n = 22) from the Kerala Registry of Epilepsy and Pregnancy (KREP). Group C was constituted of healthy volunteers (N = 20). Oxidative stress was assessed by estimating serum levels of malondialdehyde (MDA) and isoprostane (ISP). The antioxidant profile was evaluated as activity of superoxide dismutase (SOD), glutathione reductase (GR), catalase (CAT), total antioxidant status (TAO), and glutathione (GSH) content. Results: The MDA and ISP levels for group EM (3.46 + 0.82 and 17.77 + 3.0) were higher than that of group ENM (3.07 + 1.02 and 14.0 + 5.3), and both were significantly higher than that of group C (2.42 + 0.51 and 10.77 + 4.1). Their levels of SOD (146.82 + 42.64 vs. 175.81 + 42.61) and GSH (0.98 + 0.98 vs. 1.55 + 1.3) were significantly lower than those of controls. No significant changes were seen in TAO and GR. WWE on polytherapy showed significant increase in MDA when compared to monotherapy group. Conclusion: WWE (group EM and ENM) had higher oxidative stress and reduced antioxidant activity. The subgroup of WWE with unfavorable pregnancy outcome (group EM) had higher oxidative stress. Excess oxidative stress can be a final common pathway, by which AEDs exert teratogenic effects. Background and Objectives: The present study evaluated the direct costs of active epilepsy and looked at the pattern of drug prescription and utilization in epileptic patients visiting the neuroscience centre of a national hospital of India. Materials and Methods: A total of 134 epileptic patients were studied over a period of 4 months. Patients demography, commonly prescribed antiepileptic drugs (AEDs), socioeconomic status, direct costs, response ratio (RR) for newer drugs, and quality of life (QOLIE-10) was evaluated. Results and Discussion: We found a higher percentage of male patients (67.9%) as compared with females. Most of the patients were in the age group 11-30 years and majority of them (39.6%) belonged to lower middle group. A higher percentage (68.7) of drugs was prescribed as polytherapy. Higher monthly cost was observed for some of the newer AEDs including the lamotrigine, levetiracetam, and lacosamide as compared with older drugs. Among the newer drugs, clobazam had the lowest cost. RR was calculated for 12 patients out of which 8 had a RR < −0.50. The QOL domains, following conventional or newer drugs, were not much affected. 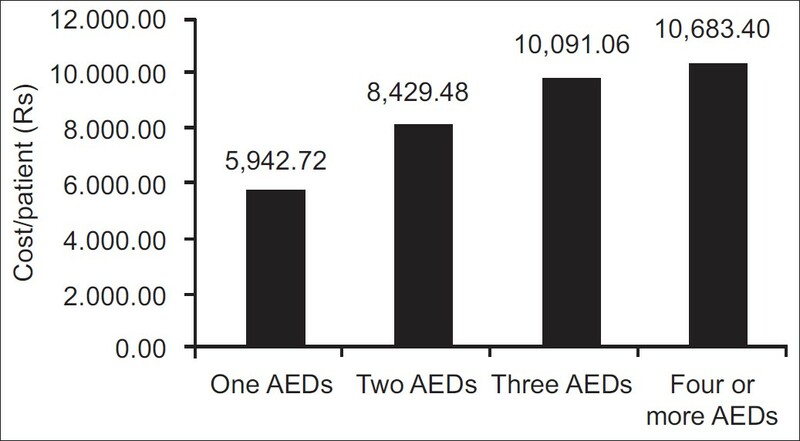 Conclusion: The study indicates an increasing trend toward clinical usage of newer AEDs, increasing trend of poly-therapy with significant escalations in the cost of therapy. Context: Few studies have been done to see the level of knowledge among patients and caregivers about Parkinson's disease (PD). Aims: The aim of the current study was to determine the knowledge of PD among patients and caregivers at a movement disorder clinic in India. Settings and Design: A tertiary care neurology facility in north India. Materials and Methods: We conducted a questionnaire based interview among the subjects collected on the annual PD day in 2006. Results: Out of 200 questionnaires that were distributed 172 subjects responded. Of these, there were 103 (59.8%) patients with PD and 69 (40.11%) caregivers. Mean age of the patients and caregivers was 55.4 ± 13.3 years and 49.4 ± 15.9 years respectively. Mean duration of PD was 6.8 ± 4.7 years (range-21). Ninety nine patients out of the 103 (96.1%) and 57 caregivers out of 69 (82.6%) had previously attended the PD education program. High scores (>90%) were obtained to questions on body parts affected, pathology in PD, main drug treatment, epidemiology and effect of exercise. Low scores were seen to questions on surgery in PD and biochemical abnormality in PD. No significant difference was noted in correct answers among patients and caregivers on duration of PD. 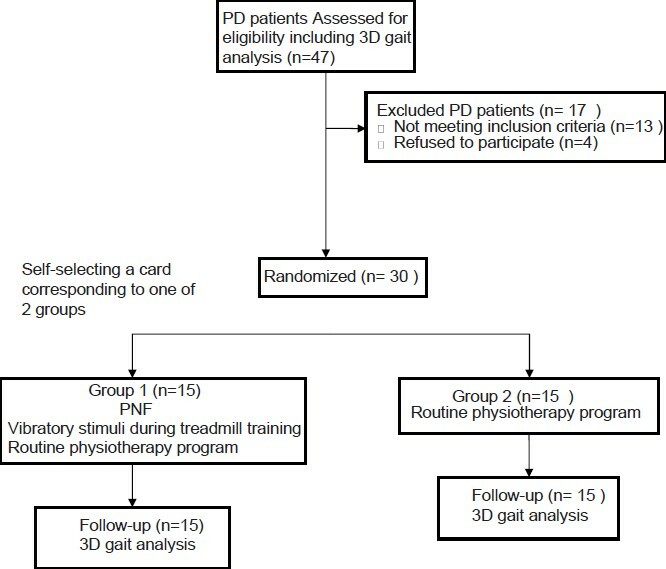 Conclusion: Patients and caregivers had adequate knowledge about PD. Patient and caregiver education programs may be useful in imparting knowledge about PD. Jean-Martin Charcot is known as father of modern neurology. Before him, neurology was only limited to select disorders like chorea. His contributions were not limited to neurology only, as he was instrumental in many new developments in the field of pathology, psychiatry, and internal medicine. Even after 100 years, Charcot`s clinical methods remain the pillar of modern neurology. Although it is a sporadic disease, few studies have reported cases of Guillain Barre Syndrome (GBS) in families which postulate a genetic susceptibility. Human leukocyte antigen (HLA) typing is an area of discussion in GBS though none of them are considered definitive. In recent years, more studies have evaluated HLA typing in sporadic cases while rarely it has been assessed in familial ones. We report a woman and her daughter experiencing GBS and their HLA typing in a 2-year interval. Chronic active Epstein Barr virus (EBV) infection causes a wide spectrum of manifestation, due to meningeal, parenchymal and vascular involvement. 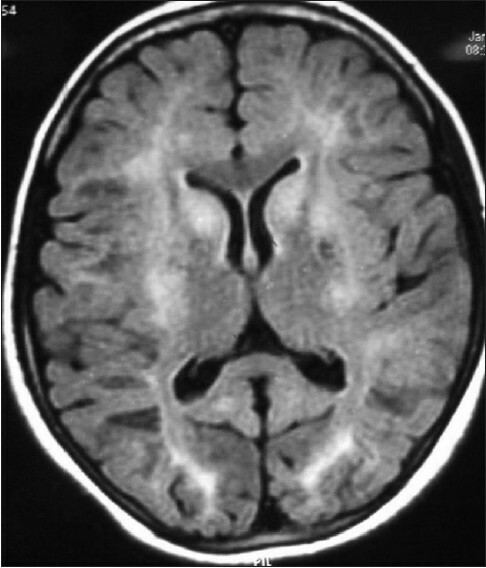 An 11-year-old boy presented with chronic headache, fever and seizures of 18 months duration. 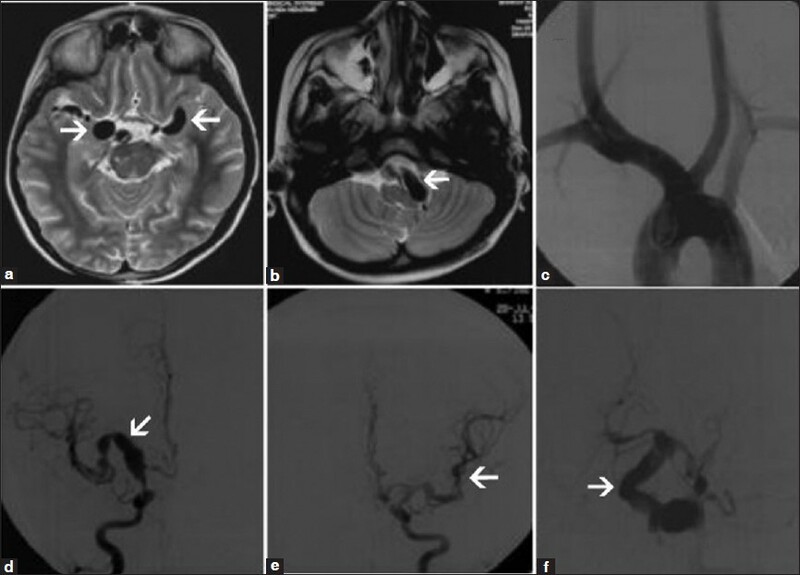 His magnetic resonance imaging Brain showed fusiform aneurysmal dilatations of arteries of both the anterior and posterior cerebral circulation. Cerebrospinal fluid (CSF) showed persistent lymphocytic pleocytosis, raised proteins and low sugar with positive polymerase chain reaction for EBV. He later developed pancytopenia due to bone marrow aplasia, with secondary infection and expired. From clinical, imaging and CSF findings, he had chronic lymphocytic meningitis with vasculopathy, which was isolated to the central nervous system. He later had marrow aplasia probably due to X-linked lymphoproliferative disorder related to EBV infection. Vasculopathy, especially diffuse fusiform aneurysmal dilatation associated with chronic EBV infection, is rare, but has been described, similar to our case report. Henoch-Schonlein purpura (HSP) is a small vessel vasculitis that is rare in adults. Here, we present a case of a woman who presented with palpable purpura, abdominal pain, arthritis and ischemic stroke. The patient met the diagnostic criteria of HSP. However, cerebrovascular disease is reported as an uncommon, yet fatal, complication of HSP. The patient responded to aggressive immunosuppression with pulses of corticosteroids and cyclophosphamide. In the absence of an established protocol of treatment of such neurologic emergency in HSP patients, this report demonstrates a successful outcome. A 12-year-old female child with motor developmental delay presented with persistent vomiting, recurrent falls and unsteadiness in dark since 2 years of age. There was decline in scholastic performance, bulbar symptoms and aggravation of symptoms during intercurrent illness. Clinically, she had frontal and parietal lobar dysfunction, dysarthria, optic atrophy and LMN VII, IX, X, XII cranial nerve involvement. There was generalized hypotonia, distal muscle wasting, weakness, cerebellar signs and impaired vibration/position sense in distal extremities. Biochemical investigations revealed elevated serum/cerebrospinal fluid (CSF) lactate and CSF lactate pyruvate ratio. Neuroimaging demonstrated bilateral symmetrical T2 hyperintensities in basal ganglia, subcortical white matter, cerebellar hemispheres and posterior aspect of spinal cord. 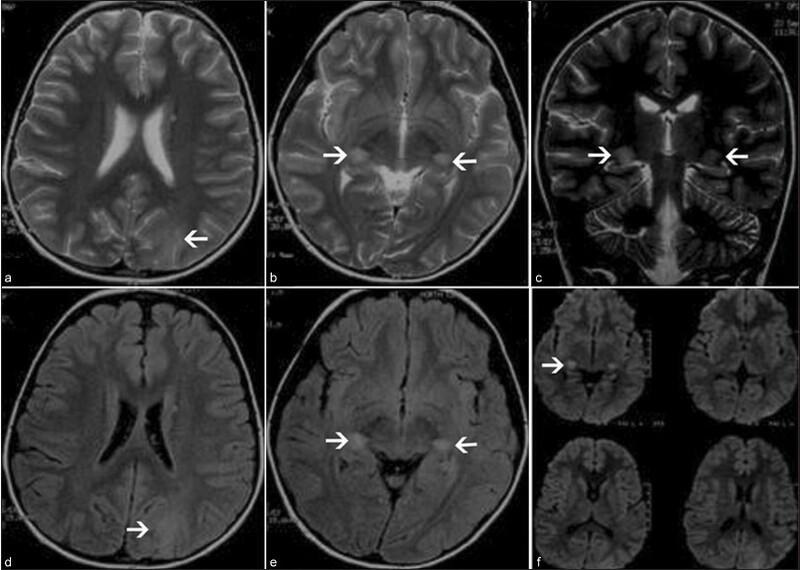 As certain atypical features like bilateral symmetrical T2 hyperintensities in subcortical white matter were also seen, metachromatic leukodystrophy was considered in differential diagnosis but ruled out by nerve biopsy. This case is reported for the presence of atypical neuroimaging features that are rarely found in Leigh's disease. The atypical neuroleptic, olanzapine (OLZ), may induce electroencephalographic (EEG) abnormalities. The anticonvulsant, lamotrigine (LMG), reduces interictal epileptiform discharges and is effective in seizures in patients with both primary and partial epilepsy syndromes. The effect of LMG on neuroleptic-induced EEG abnormalities has not been previously reported. 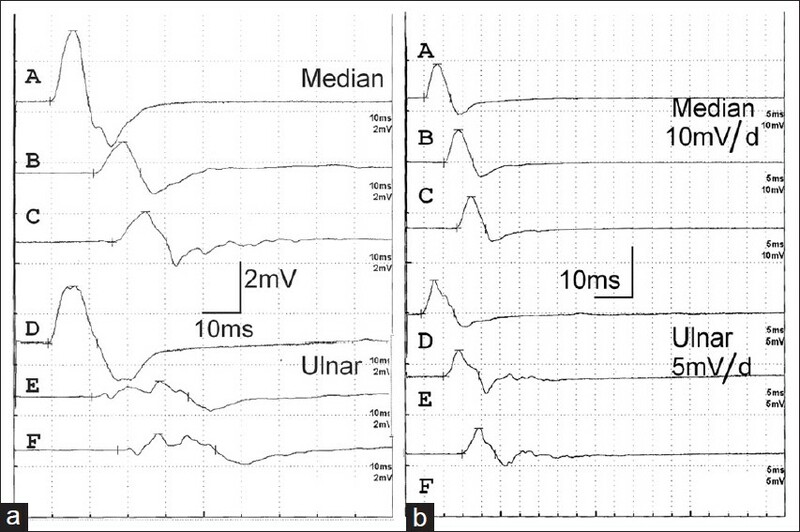 We describe the case of a 13-year-old male with paroxysmal nonepileptic spells who underwent diagnostic video-EEG telemetry, whose abnormal OLZ-induced EEG findings were strikingly affected by LTG withdrawal and reintroduction. The effect of LTG in normalizing EEG changes in suspected epilepsy caused by atypical neuroleptics is discussed. Valproic acid (VPA) is a commonly used broad-spectrum antiepileptic drug especially in children, with various side-effects reported with its usage. Hematologic toxicity is dose related and intracranial bleeding complications have been reported. We are reporting a rare case of massive scalp hematoma requiring surgical intervention, following a trivial fall associated with high-VPA levels. Thromboembolism is a rare complication in patients with myotonic dystrophy. While immobilization of patients with advanced disease predisposes to high risk for venous thromboembolism, hypercoagulability could account for venous thromboembolism in patients without impaired mobilization. We report a patient with myotonic dystrophy type 1 who developed pulmonary thromboembolism unrelated to immobilization. A 32 year old Asian female on 300 mg per day of phenytoin following meningioma excision developed a fever with a diffuse maculopapular rash, lymphadenopathy and splenomegaly after12 days. A diagnosis of DRESS (Drug Rash Eosinophilia and Systemic Symptoms) syndrome was made. Patient was started on prednisolone at a dose of 1 mg/kg but since there was further deterioration in her condition, intravenous immunoglobulin was started. Clinical and blood parameters began to improve by the next day with liver functions returning to normal by the third week. DRESS syndrome is a drug hypersensitivity syndrome which can be fatal and therefore needs to be recognized early for the appropriate treatment to be started. The use of Intravenous immunoglobulins is anecdotal and the dramatic improvement noted in this case indicates that it is another treatment choice. The case and a brief review of the literature are discussed. 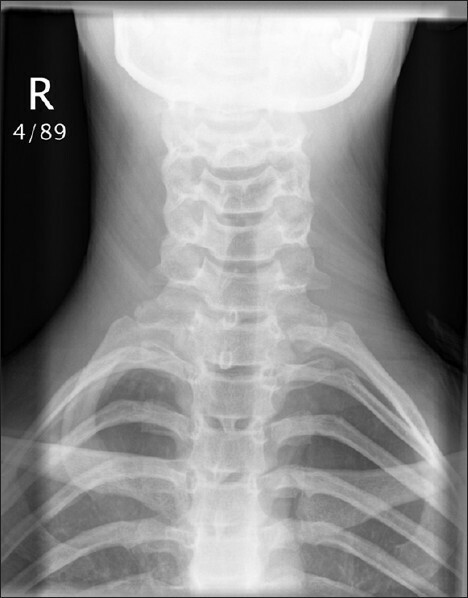 We report an adolescent girl who had left-sided neurogenic thoracic outlet syndrome (TOS) due to impingement of the scalenus anterior muscle with bilateral changes on nerve conduction studies and responded well to surgical decompression. 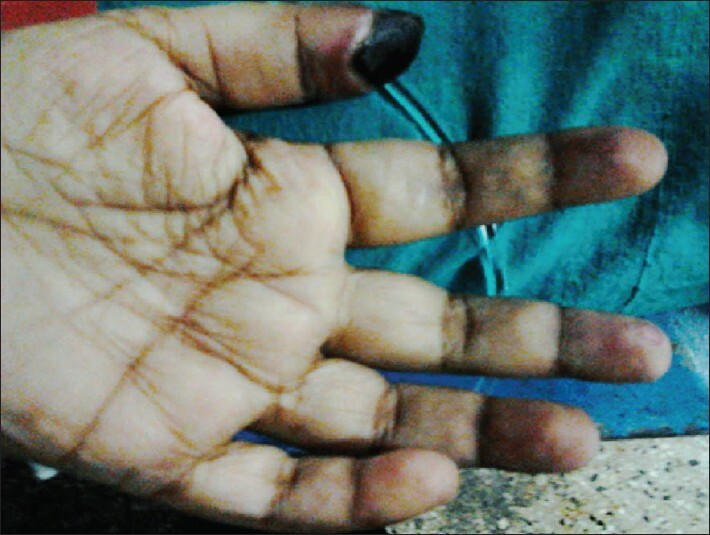 A 13-year-old Caucasian girl presented with intermittent pain, swelling, erythema, tingling and numbness of the palmar aspect of her left hand. Nerve conduction studies revealed bilateral ulnar sensory and motor conduction abnormalities, suggesting early compressive neuropathy in the asymptomatic arm as well. She underwent surgical exploration when it was noted that the scalenus anterior itself was impinging on the brachial plexus. She had a good clinical response to scalenectomy. The diagnosis of neurogenic TOS remains difficult as no single test has been accepted as a gold standard. But, once diagnosed using clinical symptoms, nerve conduction studies, electromyography and radiological investigations, it is a treatable condition with good prognosis. 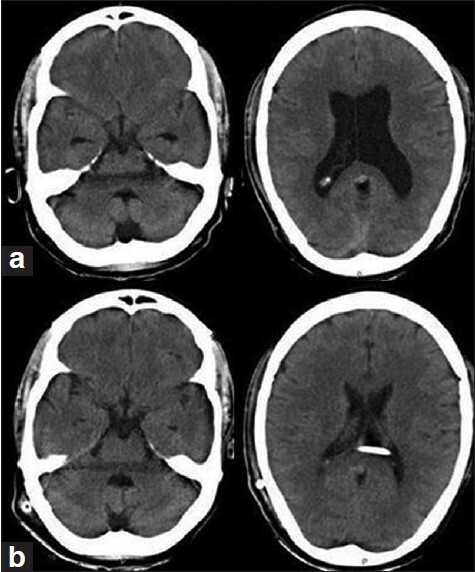 Cerebral venous sinus thrombosis (CVT) is a rare cerebrovascular disease with variable presentation. CVT rarely causes hydrocephalus. Communicating hydrocephalus due to CVT is extremely rare. 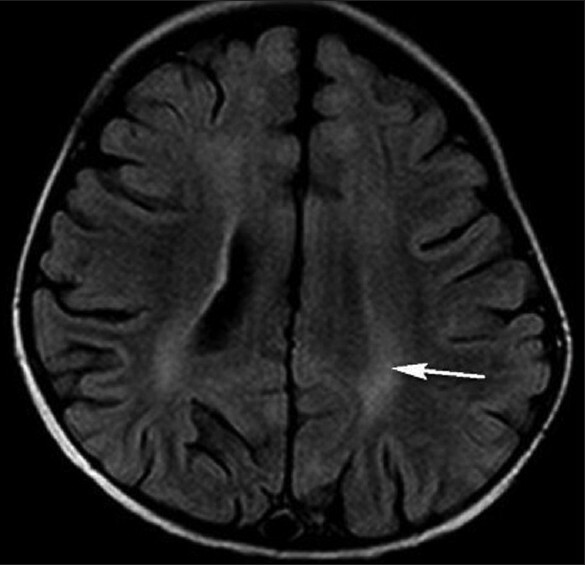 We describe a patient of CVT presenting with chronic headache and communicating hydrocephalus. The patient was successfully treated with ventriculoperitoneal (VP) shunt. A 40 year old man presented with moderate to severe headache since six months and progressive visual loss since two months. Head Computed tomogram showed mild hydrocephalus without obstruction. Lumbar puncture (LP) demonstrated elevated pressure but was otherwise normal. Magnetic resonance venogram showed extensive CVT. Repeated CSF drainage and thecoperitoneal shunt did not relieve the severe headache hence a VP shunt was placed. Post shunt headache subsided with resolution of hydrocephalus. CVT can present as communicating hydrocephalus. Gradual reduction of intra-ventricular pressure by repeated LPs followed by VP shunt can safely treat hydrocephalus due to CVT. Subacute sclerosing panencephalitis (SSPE) is chronic encephalitis occurring after infection with measles virus. An 8-year-old boy presented with progressive behavioral changes, cognitive decline and myoclonic jerks, progressing to a bed bound state over 2 months. Magnetic resonance imaging (MRI) brain showed T2-weighted hyperintensities in the subcortical areas of the left occipital lobe and brachium of the inferior colliculus on both sides. 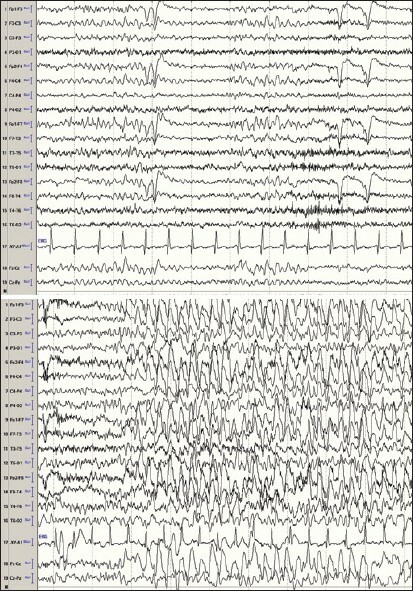 EEG showed bilateral, synchronous periodic discharges. Serum/cerebrospinal fluid measles IgG titer was significantly positive. The overall features were suggestive of SSPE. MRI finding of bilateral inferior colliculus changes on MRI without significant involvement of other commonly involved areas suggests an uncommon/rare imaging pattern of SSPE. Disorders of lipid metabolism can cause variable clinical presentations, often involving skeletal muscle, alone or together with other tissues. A 19-year-old boy presented with a 2-year history of muscle pain, cramps, exercise intolerance and progressive weakness of proximal lower limbs. Examination revealed skeletal markers of Marfan syndrome in the form of increased arm span compared with height, Kyphoscoliois, moderate pectus excavatum, high arched palate and wrist sign. He also had mild neck flexor weakness and proximal lower limb weakness with areflexia. Pathologic findings revealed lipid-laden fine vacuoles in the muscle fibers. Possibility of carnitine deficiency myopathy was considered and the patient was started on carnitine and Co Q. The patient made remarkable clinical improvement over the next 2 months. This case is reported for rarity of the association of clinical markers of Marfan syndrome and lipid storage myopathy and sparse literature on lipid storage myopathy in the Indian context. 18-Fluoro-2-deoxy-D-glucose(FDG) is a structural analog of 2-deoxyglucose and accumulates in malignant tissues but also at sites of infection and inflammation. For this reason, FDG PET or PET/CT has great advantage in understanding of underlying pathology in assessment of FUO (Fever of unknown origin). However, till today, there are limited studies about the role of FDG PET or PET/CT in evaluation of FUO. 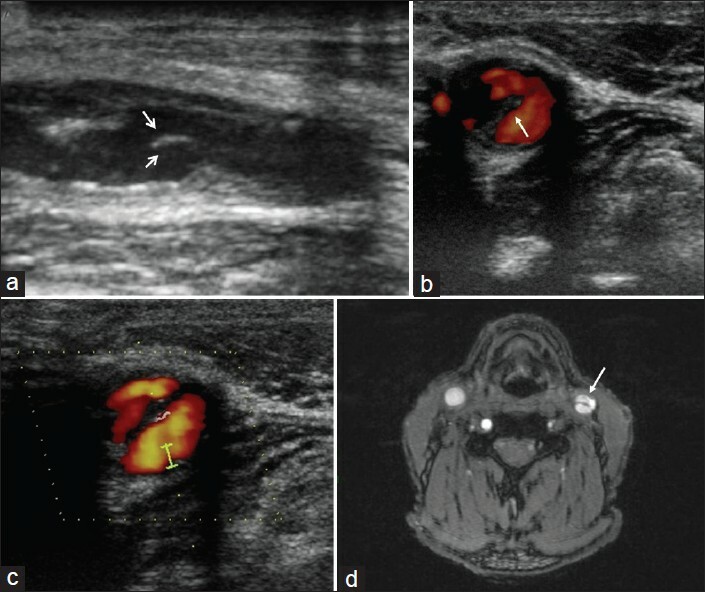 Conventional diagnostic methods are still not adequate to reveal underlying reason in approximately 50% of patients with FUO especially in cases presenting with diagnostic challenges i.e. involvement of two or more organ systems with seemingly no correlation. We report a case of two years old Indian female child who presented with fever of one month duration, CT and MRI reported nonspecific findings. She underwent Whole body 18 FDG PET/CT for further evaluation, which revealed FDG avid rim lesion with central photopenic defect suspicious of pyogenic abscess in high parietal cortex along with bilateral lung nodules. This confirmed the diagnosis of a brain abscess secondary to pulmonary infection. We emphasize the utility of 18 FDG PET/CT as imaging modality, highlight the diagnostic difficulties using current serological and radiological measures, and propose managing FUO with 18 FDG PET/CT in cases empirically prior to more invasive measures. Hyperkalemia manifests clinically with acute neuromuscular paralysis, which can simulate Guillain Barré syndrome (GBS) and other causes of acute flaccid paralysis. Primary hyperkalemic paralysis occurs from genetic defects in the sodium channel, and secondary hyperkalemic paralysis (SHP) from diverse causes including renal dysfunction, potassium retaining drugs, Addison's disease, etc. Clinical characteristics of SHP have been addressed in a number of publications. However, electrophysiological evaluations of these patients during neuromuscular paralysis are infrequently reported and have demonstrated features of demyelination. The clinical features and electrophysiological abnormalities in secondary hyperkalemia mimic GBS, and pose diagnostic challenges. We report the findings of nerve conduction studies in a middle-aged man who was admitted with rapidly reversible acute quadriplegia resulting from secondary hyperkalemic paralysis. Emery-Dreifuss myopathy can be associated with a cardiomyopathy and cardiac dysrhythmias. The inheritance pattern of Emery-Dreifuss muscular dystrophy (EDMD) is X linked, whereas EDMD2 is autosomal dominant. EDMD2 is caused by lamin A/C gene (LMNA) mutations that produce alterations in the lamin proteins that are integral to nuclear and cell integrity. 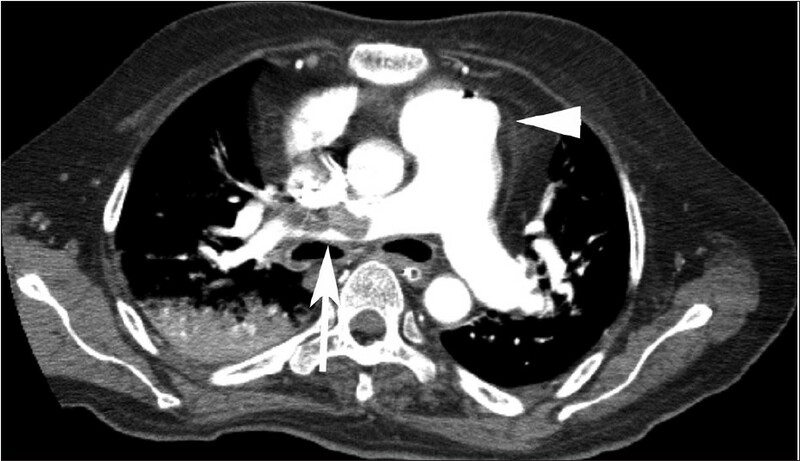 A 53-year-old man was brought to us with a right internal carotid artery dissection. Detailed work-up of the patient and family members revealed some unusual features, and genetic sequencing of the LMNA gene was undertaken. A novel mutation was identified in two of the samples sent for analysis. 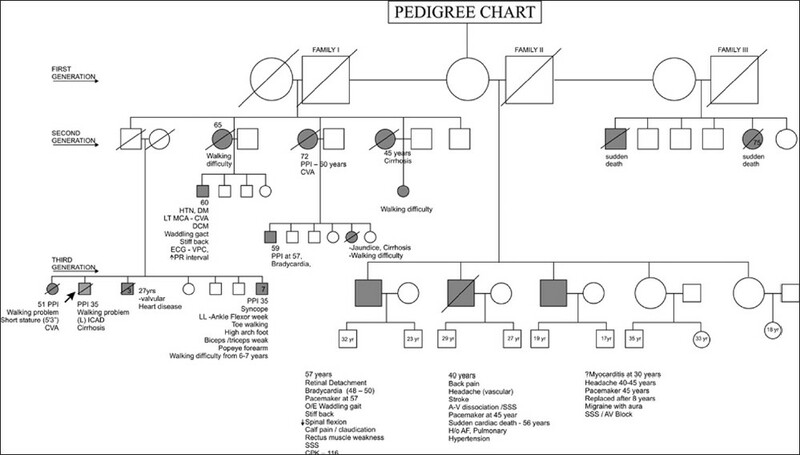 We present the first Indian family of EDMD2 with familial dilated cardiomyopathy and cardiac dysrhythmias in whom LMNA gene sequencing was performed. A novel mutation was identified and additional unusual clinical features were described.